I'm so glad to show you photos featuring gorgeous new items I recently got from Black Sanctuary! It's one of my favorite brands, maybe a lot of you already saw a lot of posts wearing their Uzumaki t-shirt which I love, I'm so flattered I had the chance to work with this amazing Italian brand and share with you all the amazing pieces I got! 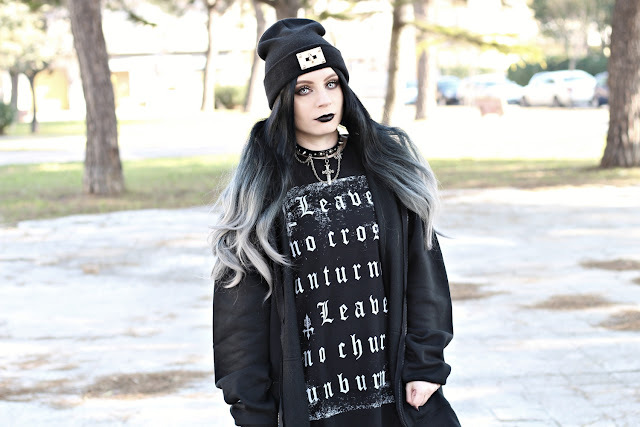 Let's start with some of my favorites, I'm a big fan of the black metal band Darkthrone so when I saw this tee inspired by them I fell in love, I paired it with this gorgeous and super warm oversize hoodie (look how beautiful the print on the back is! ), fishnet tights and my favorite platform boots. Some people asked me about the size and everything is XL to go oversize on me :D so if you want to wear them like a dress don't forget it!